In recent months there has been a lot of ridicule and sarcasm directed towards a TV ad for Herbal Essences Bio Renew Shampoo, which boldly declares itself as having ‘No gluten’. View it here. I’ve found some of it frustrating, because it’s been knee-jerk and played for cheap laughs: “Thank goodness — I was going to have some shampoo for breakfast!” Ha, ha, ha. Yet gluten is no joke to lots of people. Free from labelling is helpful to many, and the presence of allergenic ingredients in cosmetics isn’t likely to be declared as explicitly as it is in food. This matter deserves a more considered debate, and I hope what follows contributes to it. Is there gluten in cosmetics? ‘Neat’ gluten is not used, to my knowledge, in any cosmetic. Wheat, barley and oat derivatives are used. They may appear in ingredients as triticum vulgare, hordeum vulgare and avena saliva, respectively, following INCI labelling requirements. Wheatgerm oil is a moisturising agent. Just oil, it should be free of protein / gluten. Wheat starch (a volumizer) and hydrolyzed wheat starch (a conditioning agent) are also used. Just carbohydrates, these should be free of gluten. But what about hydrolysed wheat protein (HWP)? This is broken-down wheat protein or peptides, and is used in hair products because peptides bond with follicles, giving thicker-looking hair. Can wheat peptides penetrate the skin — and incite the immune system? Yes, and here’s a paper confirming so. As does this one. And this paper is alarming, suggesting HWP through eye exposure could lead to food allergy. Granted, these concern allergies, and coeliac disease is autoimmune. But it tells us that people with wheat allergies do need wheat-free cosmetics and might find a gluten-free claim useful. Studies also suggest those with eczema may do well to avoid food allergens in cosmetics, as otherwise their risk of developing allergies to those foods could increase. I’ve previously addressed this in relation to oats. To my mind though, this doesn’t mean there is no mechanism or consequence of dermatological exposure that we don’t yet know about. I don’t think the issue has been sufficiently examined to draw that conclusion: I’ve looked for studies and cannot find them. The average time for a coeliac diagnosis is over a decade. Just imagine what it is like to feel wretched for that period, and to then find out the cause is gluten — a protein harmless to most, but toxic to you. You’d want this toxin out of your kitchen, naturally, but is it not reasonable to want it out of your bathroom as well — no matter what experts, charities and scientists collectively say — especially if you are particularly sensitive or have gluten ataxia? Would a gluten-free claim not be useful to you in such a circumstance, given that, unlike in food, wheat can ‘hide’ behind terms such as ‘amino peptide complex’ in toiletries? Given what they have experienced, I refuse to tell people who’ve been made ill by gluten for years that there’s nothing to worry about and to use any cosmetic they like. Instead, I tell them it’s probably OK, and unlikely to be an issue, but if still worried then Green People have removed wheat from their haircare products and replaced it with quinoa. Women may be more concerned about lipsticks, not unreasonably in my view, and I usually suggest NATorigin to them. And if you’re worried about other food allergens, then look at brands such as Myroo — which make a point of being free from all 14. And if a discreet gluten free (or nut free, or milk free) confirmation on a cosmetic gives folk peace of mind, then fine by me. If you’re not worried, or don’t need the reassurance, there’s no need to go looking for it. I say discreet, above, because that’s how I feel ‘free from’ labelling should be — on the back of a product, somewhere alongside the ingredients, given equivalent prominence to what is actually in it. Because ‘free from’ labelling is for ‘free from’ people. It is there to help them. And free from people are quite prepared to go looking for it. They don’t expect it front of pack. When it’s front of pack, perhaps highlighted, or in their face, they know it’s unlikely to be aimed at them. It’s probably aimed at others. 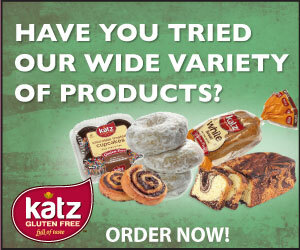 We shouldn’t be ridiculing the existence of gluten free cosmetics, nor criticising the brands who demonstrate the good allergy awareness and knowledge of ingredient provenance required to make ‘free from’ declarations — whether they do it on back of the product, or on their website, often merely in response to repeatedly being asked by potential customers. Besides, if we are to advise eczema folk to avoid food allergens in cosmetics, then free from labelling is invaluable. No — none of that. Instead we should be challenging those who put “0% gluten” — which would be an illegal claim on food, by the way — on the front of their cosmetics and who shout about this “stuff” in their advertising campaigns, clearly designed to catch the attention of those for whom gluten isn’t a concern. And the only reason to do that I suspect is because you’re trying to make it a concern. And that’s fearmongering to boost sales. Using a buzz-word as a marketing ploy. It is irresponsible bandwagon-jumping which muddies the waters and engenders scepticism about gluten-related disorders. It is blatantly misusing free from labelling — which puts free from labelling at risk for those who really need it (plenty of mainstream brands and orthodox cosmetic scientists despise free from claims and are calling for severe restrictions on their use). Herbal Essences, I’m looking at you.